For those born February 9, 1952. You're one of the first people who's never lived in a world without color-TV broadcasting. In June 2015, Benjamin Gross wrote about the impact of using live models to calibrate color TVs in the 1950s. Around the time you were born, King George VI of the United Kingdom died at the age of 56. In February 2012, Heather Horn wrote about the 60th anniversary of Queen Elizabeth II's ascension to the throne. You were born in February of 1952. This year, The Atlantic celebrates its 160th birthday, making it 2 times as old as you. The year you were born, Arthur E. Sutherland wrote about the obligation of the press to tell the "whole truth," despite growing challenges. Beach Blanket Bingo was released in 1965. At 17 years old, you were alive to behold people walking on the moon. Around your 18th birthday, five members of the so-called Chicago 7 were convicted of inciting riots. In July 2016, Julian E. Zelizer wrote about how America is ignoring the lessons of 1968. 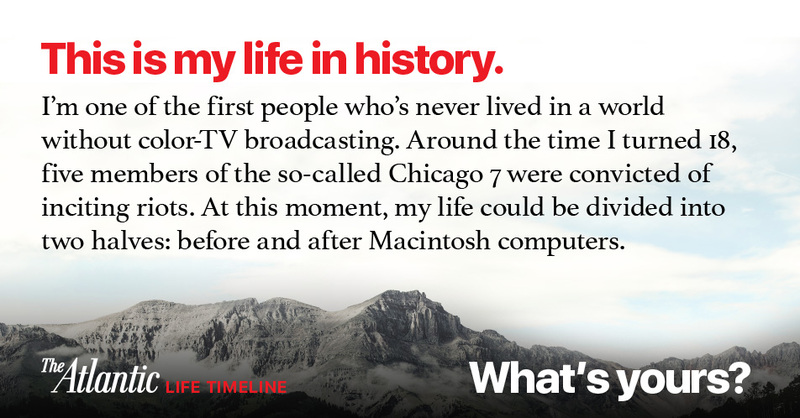 Your life can be divided into two halves: before and after Macintosh computers. In June 2012, Megan Garber wrote about how Apple computers, once thought to be virus-immune, can now get PC viruses. When you turned 55, you watched humankind reach the outer solar system. In 2012, Vladimir Putin, who was born the same year as you, was reelected to his third term as president of Russia, amid protests and allegations of electoral fraud. In December 2016, Larry Diamond wrote about how Vladimir Putin is making the world safe for autocracy. By the time you turn 68, scientists estimate it will no longer be possible to keep global temperatures from rising at least 1.5 degrees Celsius.